It has been almost six years since the ethnic folk music ensemble Kardeş Türküler released their last studio album, Bahar (Spring). Fans have been waiting for a long time for new songs and this longing has finally come to an end. Kardeş Türküler released its newest album, Çocuk (H)aklı (The Kid is Right/The Kid's Mind), on Tuesday. The album is made up of 16 songs in the Armenian, Turkish, Arabic, Kurmanji and Laz languages. In the CD, the ensemble offers many novelties. 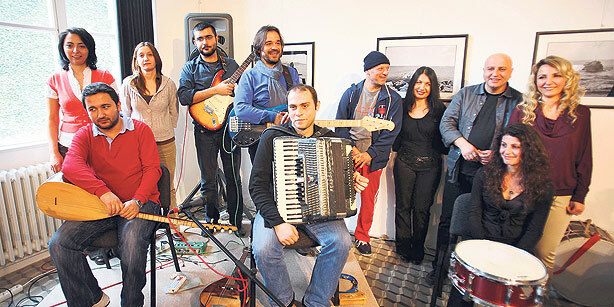 Unlike their previous albums, in which they mostly reinterpreted well-known folk songs from across Anatolia, Çocuk (H)aklı largely consists of works composed either by a member of Kardeş Türküler or Tunçboyacıyan. A notable track on the CD is Zamanın Bahçesinde (In the Garden of Time), a song written by well-known Armenian musician Ara Dinkjian. The album also includes a song called Daymohk (Homeland), a song in the Chechen language, which is a first for the band. A Yezidi hymn called Qewlê Kofa (The Hymn of Cofi) is also being featured for the first time in Turkey. The theatrical character of the group's onstage performances remains, just like their motto. We continue to make a call for peace and coexistence, said Feryal Öney, a prominent member of Kardeş Türküler, at a press conference on Tuesday to launch their new album. However, as people who have been making music for almost 20 years, we believe that it is not sufficient to only represent different religions and cultures [through music]. The issue of [ethnic] identities has been discussed a lot in Turkey, particularly since the 1990s, and [Turkey] has made quite some progress in this area. So, the question is not how to represent different cultures, but how we will make these cultures survive in our daily lives without turning them into subcultures; how these cultures will coexist without forming a cultural hierarchy. We have been seeking an answer to these questions and we're doing this through music. And you will be able to see this on the album, Öney explained. This album can be seen as a seed, added Tunçboyacıyan. My brother Onno [Tunç, who died in 1996,] used to say that everything would come out by itself when the time is right, otherwise it would not be mature. So, this is the right time for this album, he said. Tunçboyacıyan also touched upon the Monument to Humanity, billed by the prime minister as a monstrosity, in the eastern province of Kars, and how saddened he was because it was going to be demolished. Turkey is undergoing a process of change, Tunçboyacıyan said. This is inevitable, Turkey is on the way [to change] and there's no return from that. We have to walk this path together and nobody should get hurt [in the process]. In the end, we will sit and take pleasure in the same garden all together. Today, Turkey's outward appearance has changed a lot, but what is essential is a change in mentality and [the ability] to talk about real problems, he said.